Real talk: I live in food-delivery central. Thanks to all the tech folks around here, we’ve got a thriving on-demand economy, including multiple services that will bring a restaurant order straight to your door. I don’t even have to step outside my apartment to get my favorite Thai fried rice, delivered warm and spicy and exactly how I like it. And unfortunately, that makes it really easy to fall off the cooking wagon. Lately, with work ramping up its stress levels and the summer drought-heat sapping my energy, I’ve been spending way too much money on greasy takeout. It’s not like there’s no food in the house; the freezer is stocked with my favorite meal building-blocks, like sweet potato filling and tomato sauce and egg rolls. But it’s the instant gratification that gets me, the siren song of something filling and unhealthy that requires no effort on my part. No chopping, no stirring, no dishes–just a delivery fee and some wasted plastic containers. It’s a terrible habit to fall into, and a terribly easy one too. This week, I’ve committed to breaking the habit. I’ve been allowing myself to cook stuff on a whim, to run to the grocery store every day if I want to. I’ve also been leaving myself with leftover ingredients, so that I’m forced to find ways to put them to use. This is my latest leftover use-up, and a really delicious one. It started with some smoked mozzarella, which I bought because it was the cheapest mozzarella option at Trader Joe’s. 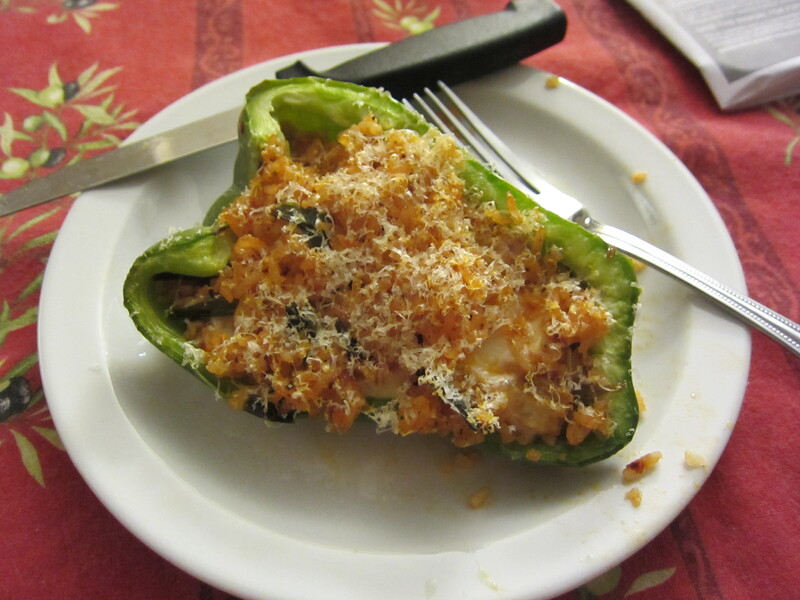 I snacked on some of it, crumbled some of it onto pizza, and then was left with a nubbin of cheese and no plan for it. I had an unused bell pepper, along with some leftover steamed rice (from, uh, Thai takeout). Mixed up with a few pantry staples and some scallions, the rice and cheese became a rich, smoky, slightly spicy stuffing for the bell peppers. It was indulgent without being greasy, which was exactly what I was craving. Suddenly I had a Sunday night dinner that was fresh, nourishing, and totally impossible to call up through an app. I used to not “get” zucchini bread. Out of all the baked goods in this world, why would you choose zucchini bread? It’s a vegetable dessert. It’s a sugary-sweet cake with something green snuck in. It’s what you resort to when you’ve got bushels of zucchini to use up and you’re sick of zucchini. I wasn’t into it. Of course, then I found myself with zucchini to use up, and I was sick of zucchini. So I decided to cry uncle and do some baking. 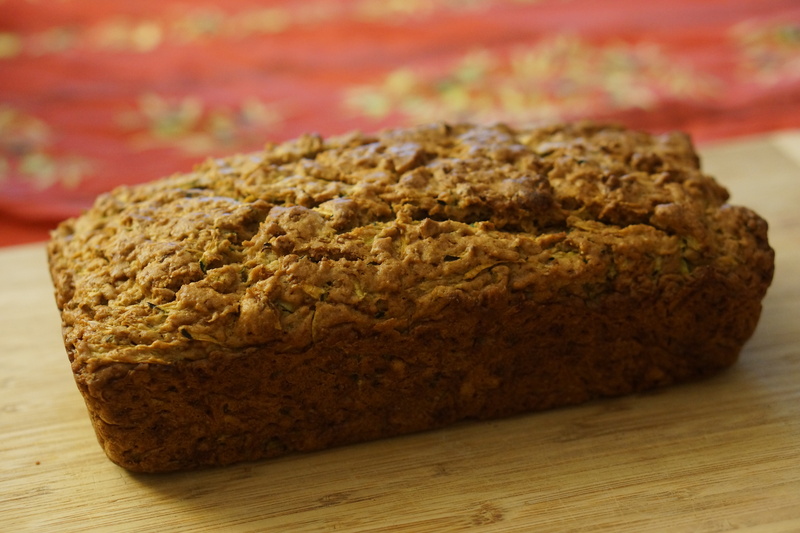 And it occurred to me that, after all, zucchini bread is just a hop, skip and a jump from carrot cake, which I adore. Carrot cake isn’t really about the carrots; they’re there for texture and moisture, maybe a bit of color, but not so much for their intrinsic carrot-ness. But the best carrot cakes, in my opinion, are unmistakable for what they are; they’re not spice cakes, or raisin-and-nut loaves. You wouldn’t think of removing the carrots, or replacing them with something else. They’re essential to the cake itself. So why not think of zucchini bread the same way? I tinkered with a pretty standard recipe I found online, and came up with something that–to my surprise–I liked quite a lot. It’s a zucchini bread that almost walks the line between sweet and savory. It’s definitely a cake, but with half the sugar, a bit of whole wheat flour, and a perk of olive oil. The zucchini flavor is clear–not pronounced, just a hint of grassiness in the background. A few of us ate half the loaf for dessert after a light Sunday lunch, and it was perfect; the rest got bundled along for breakfast on the go the next morning, and it was great for that too. One note: even though I’m calling this an “olive oil” bread, I actually use 1 part extra virgin olive oil to 2 parts canola oil. I’m not crazy about using all extra virgin olive oil in baked goods like this, since I think the flavor overwhelms. But I do like a bit more oomph than you’d get with just regular olive oil, and this ratio does it for me. Feel free to adjust the proportion of olive to canola oil as you like–you’ll need 3/4 cup oil in total.